Texas Instruments CONCEPT I distributed by Zayre Corp.
You have to look twice to catch the differences between this rare CONCEPT I and the TI-1200 calculator. The only differences between the calculator is the color scheme of the faceplate. Dismantling the CONCEPT I reveals no surprises - the printed circuit board (PCB) of the calculator is 100% identical with the common TI-1200. 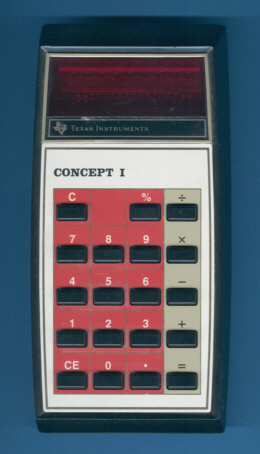 The CONCEPT I calculator was introduced in March 1976 and discontinued already in January 1977 with the blow-out sales of the CONCEPT I, CONCEPT II, CONCEPT 10, and the 2nd and 3rd design of the CONCEPT 24 calculators.